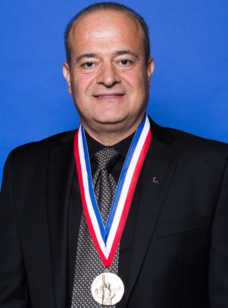 It gives us a great pride and honor to congratulate our President & CEO Mr. George Mobassaleh for having received the “ Ellis Island Medal of Honor “ during a joyous celebration that took place on May 13th,2017 on the Ellis Island – New York . It’s worth mentioning that, this Medal was formerly granted to seven U.S Presidents, a few World Leaders, in addition to number of ; Scientist , Artists , Educators , Sports Legends , Politicians and a numerous dignitaries, and has been recognized and commissioned by the House of Representatives as well as the U.S States Senates . George, who is known as a philanthropist, industrious and an entrepreneur, is one of the most distinguished CEOs in Florida , and a perseverant who notably contributed massively in the prosperity of the Beauty Supplies industry Statewide , he is further known as a prominent figure amidst all Ethnicities and the local Communities for being an Equal opportunity Employer and a generous Community supporter . We’re likewise honored, and quite proud of you George , we wish you an optimal health and an ultimate ability to carry on your ambitious mission and vision . Congratulations , you have just made a legacy Boss.